Provided Synopsis: In this adrenaline-charged thriller, genius-hacker Lisbeth Salander and journalist Mikael Blomkvist face a dangerous new threat and must again join forces. Late one night, Blomkvist receives a phone call from a trusted source claiming to have information vital to the United States. The source has been in contact with a young female super hacker—a hacker resembling someone Blomkvist knows all too well. The implications are staggering. Blomkvist, in desperate need of a scoop for Millennium, turns to Lisbeth for help. She, as usual, has her own agenda. 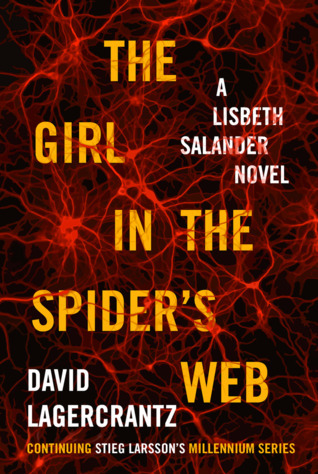 In The Girl in the Spider’s Web, the duo who thrilled 80 million readers in The Girl with the Dragon Tattoo, The Girl Who Played with Fire, and The Girl Who Kicked the Hornet’s Nest meet again in an extraordinary and uniquely of-the-moment thriller. Review: After having fallen in love with Stieg Larsson’s Millennium Trilogy and its protagonist Lisbeth Salander, I was very wary of the idea of the story being continued on by another writer in defiance of what is said to be Larsson’s wishes. I did not see how another author could do the story or the characters justice. But curiosity won out, and I am glad that it did because I enjoyed this book a lot. To be truthful, it must be noted that I have not read the original trilogy in a very long time, so I am in no way able to determine if Lagercrantz aligned his characterizations of Lisbeth and company truthfully to Larsson. All I can say is that I felt as if I was able to fall right back into the fast lane with ease, once my mind began to connect all of the characters together with one another in accordance with all that had happened in the past. If you are a hard-core fan of the series, with enough of a connection to the characters in the sense that you live and breathe them to the extent that you truly know them, then you might feel differently. But if you are like me then I think you will be pleased to return to a crime novel filled with journalism, revenge, hackers, etc. I never felt bored by this story; it was easy reading all the way through and it held my interest. My main complaint is that there is not enough Lisbeth! She is there, of course, but so are so many other returning and new characters that the reader must follow. With the way things have been set-up I am anticipating this reincarnation of the series to also form a trilogy, and I can see her perspective taking much more of a prominent role as things go further to unravel the mysteries of what has become of the legacy Zalachenko left behind.